← Don’t Rock the Boat! Note- I wrote this post before I left Paris. Enjoy! 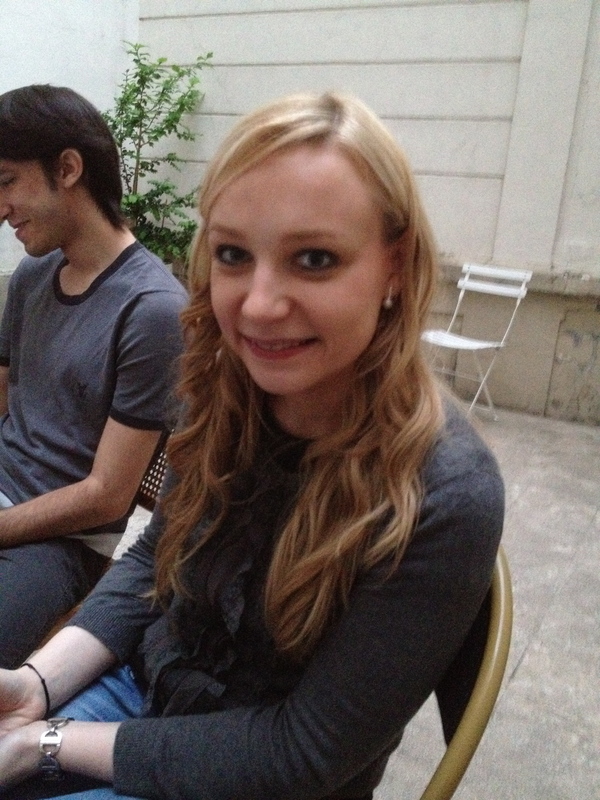 One of the many new experiences I encountered when I moved to Paris was that of living in an apartment building. Like most buildings here, ours has 6 floors . Each floor has only one apartment on it, and two of our floors are offices, which means there are three families living here, plus my friend whose parents built out some maids’ quarters on the very top of the building, transforming them into a lovely apartment with a terrace and a view. I have been disappointed, but not surprised, that after living in the building for 6 months (and don’t forget that Mark moved in a year before that) I had not gotten to know any of my neighbors. It seemed so strange to live in such close proximity of people whom I wouldn’t recognize on the street. No “Welcome to the neighborhood” cakes or casseroles or flowers. Nada. So NOT the way we do it in Texas. So I was delighted when one day I passed a young woman at the front doors of our building and she asked me if I knew of anyone who might want to have French/English conversation with her. Uhhhh, yeah! C’est moi! And that’s how I met my sweet friend Claire. Since that day, Claire and I have met many times for conversation. We make notes of the corrections that we make to each other’s second languages (actually, English is her third or fourth language) and neither of us is afraid to make mistakes. We have also gone to a photography exhibit together, and last week we went out for my “goodbye” dinner. Yeah, she IS just a few years older than my oldest child, but she doesn’t seem to mind hanging out with an old fogie. I did introduce her to Mlle Cordon-Bleu, and they have gone out together several times, too. But I know she likes me better. Right, Claire? One day Claire sent me an email telling me about a “Neighboring Party” she was arranging with another woman in the building. It turns out that France has something similar to our National Night Out, to encourage neighbors to get together once a year and maybe even learn each other’s names. 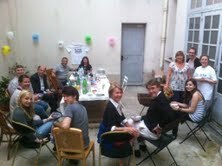 We all met in our small courtyard, where a large make-shift table had been set up, and the garbage bins moved out. The woman on the fifth floor, who is Spanish, made an enormous paella, which I am so sorry I neglected to photograph before we devoured it. The man on the fourth floor brought several bottles of wine and champagne, and there was also a nice array of appetizers. I contributed a mixed berry cobbler, which was a big hit with the Frenchies. Our concierge, who helped organize the evening, made some of her Portuguese specialties, and seemed to enjoy seeing all of her building residents together. In addition to our building residents, two women from the hair dresser next door to our building accepted an invitation to join us, and the car parker for the swanky restaurant across the street also dropped by for a quick drink (of Coke, I hope) at the end of the evening. None of those three spoke English, but all but one of our building neighbors spoke at least some English. One man is actually American, but has been here for decades and married a French woman, who speaks quite good English, but thinks we should speak French since we are living there. There was also a very nice couple who live in an apartment off the entry, outside our elevators, who are from Lebanon but speak good English. They are expecting their first baby in September and plan to name her Kate! I clearly made a very good impression. Or maybe they just really liked the cobbler. 1. Which of you snores like a freight train and likes to nap on weekends? 2. Who is the poor allergy sufferer who sneezes his head off on a regular basis? 3. Who has a house cleaner who sometimes brings her baby and sings to her while she works? 4. Whose kids have a lot of friends and like to throw parties until the wee hours of the morning? Alas, the answers to these questions will have to remain a mystery, at least until the next Neighboring Party. Hi Sylvia! Yes, we are here and hope to see you before we leave. WE plan to be here most weekends in July, so there will be other opportunities. You should come over for cocktails or dinner. Hi Kate! Brooke and I have been enjoying your posts. We are waiting at the French Consulate office right now for her to apply for a visa. I hope she has a wonderful experience like you are. I hope you’re enjoying your visit home. Oh, the French COnsulate! Such a friendly group! Have fun with them! I’m glad you both are still enjoying my blog. I can’t wait to hear about her experience! AND she must come to our apartment in the fall! She will, right???? 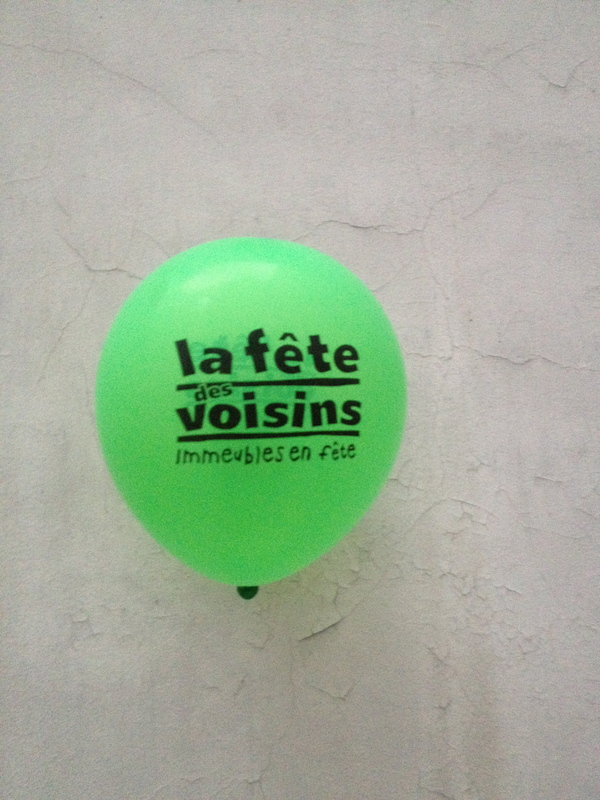 There’s an American equivalent of La Fête des Voisins? I didn’t know that! In spite of the sneezing, snoring, party throwers in your building, you’re so lucky to have a paella making Spanish neighbor. Thanks for clarifying that this post was written earlier otherwise I would have thought that you were back in Paris and proposed that we get together. I’m just about to re-new my AMG membership for another year of tours and outings! I need to re-new my membership, too! I look forward to more interesting tours avec toi!